2,000,000:1 Dynamic Contrast Ratio provides sharper image quality. LG’s ISFccc Ready HDTVs contain the detailed standards necessary for professional calibration of contrast, tint, sharpness and colour levels to meet local lighting conditions for both day and night time viewing. Settings are added to preset modes for easy access from the LG remote. 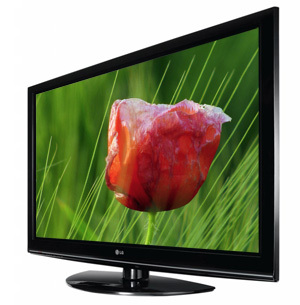 LG HDTVs include 3 AV Modes, preset to optimize picture and sound settings based on Cinema, Sports or Game content. AV Modes can be easily set with a convenient button on the remote control. Cinema Mode is pre-calibrated using ISFccc parameters for a film-like experience. With LG's 600Hz sub-field driving refresh rate technology, see realistic movement in Sports, Action, Movies and Video games like never before. Automatically enhances and amplifies the sound of the human voice frequency range to help keep dialogue audible when background noise swells. Can also be personalized with a new 12-step adjustment level. With an ultra-high dynamic contrast ratio of 2,000,000:1, the 50PQ10 will impress gamers, movie buffs, and design enthusiasts alike.